I must say that it always amazes me when I hear of some league out there that purchased a trophy for their fantasy football league from a typical, run of the mill trophy shop with your typical, run of the mill trophies. You know what I’m talking about. The trophy that the pee-wee football team down the street plays for. The one with the giant gold football or the awful golden player giving that lame stiff arm. We’ve all seen them. Hell, I think my parent’s still have mine, from my own pee-wee days, collecting dust in their basement. 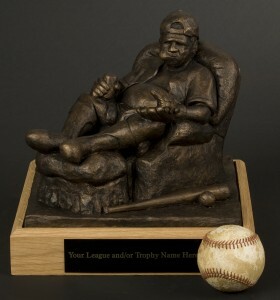 However, if you think those are bad, you need to do a google image search for “fantasy baseball trophy”. The choices out there are truly unbelievable. Golden mitts, bobbleheads and cheesy sculptures of players “in action” litter the web. Seeing photos of guys holding them in celebration is the worst part. What the hell were they thinking?